The main barrier to implementing the universal free school meals (UFSM) policy for some schools is capacity. In many cases the dining hall just isn’t big enough and/or the kitchen is too small to serve a large number of children. In West Sussex for example, school kitchens were replaced with IT suites many years ago. How are they going to effectively rise to the challenge of UFSM with limited sized kitchens as well as maintain a capacity to grow the paid meal uptake for older children? To give children enough time to eat their dinner, schools will have to consider extending the lunch hour which will result in lost learning minutes. This will be perceived as a recipe for disaster because children’s social time is compromising their learning time. It’s tempting, therefore, for schools to increase learning minutes by reducing lunchtime. Recent Children’s Food Trust research has found that nearly a quarter of teachers across all schools (23%) had seen lunchtime get shorter at their school in the last few years. Having worked with schools in East Sussex and Brighton & Hove for the last 10 years on improving lunchtime I think UFSM offers schools a real opportunity. Firstly, headteachers should consider extending lunchtime if the school believes their facilities can’t cope with the introduction of UFSM. If schools don’t to this, it means children are likely to go back into afternoon lessons not ready to learn and not being able to concentrate properly because they haven’t been given enough time to eat their dinner. In many schools I have worked in teachers complain that the first 10 to 15 minutes of their afternoon lessons are spent talking about unresolved lunchtime incidents. This creates a barrier to learning. If, therefore, lunchtime is extended by up to 15 minutes the children are more likely to go back into class ready to learn and will end up learning just as much as they did before lunchtime was extended. Secondly I think headteachers need to recognise that lunchtime is an integral part of the academic day and it offers real learning opportunities. 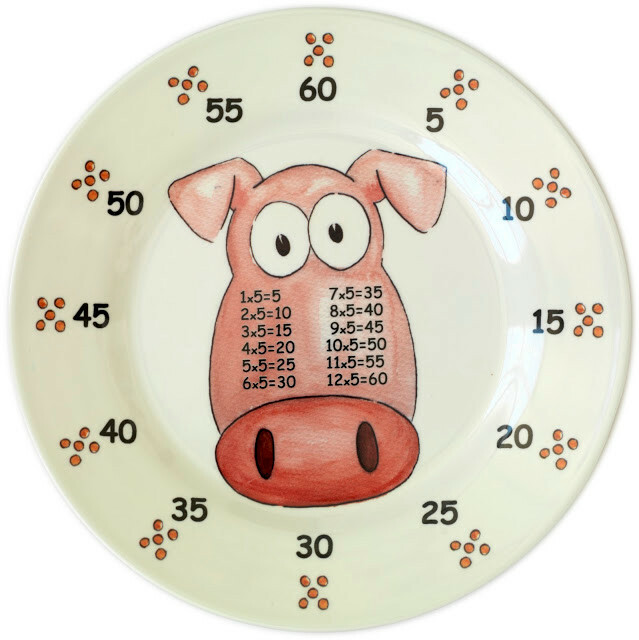 One evidence based example of this is the introduction of Times Table Plates with memorable and engaging animal characters printed on them to represent each of the 12 times tables – e.g. Porky Five Bellies for the 5 times tables. Children can also access lunchtime apps as part of using the Times Table Plates giving details of the daily menu, the recipes and healthy eating information. This is a community based initiative which is specifically aimed at engaging parents as well as children. The learning outcomes, therefore, should have a beneficial impact on the whole school community. In one Yorkshire school the Times Table Plates improved instant recall and reduced ReFood waste from 80kg to 45kg. So the children were learning more and eating more. Each of the 12 Times Table Plates features one of the wonderful characters who are collectively called “theMultiples”. Another key learning opportunity, particularly for reception children, is teaching them how to use a knife and fork. If children continue to eat a packed lunch they will be excluded from learning this vital life skill. When Henry Ford was hiring a new executive he would take them to lunch during the interview process. If a candidate had poor table manners and, for example, salted their food before tasting it he wouldn’t hire them. So, if better social skills mean better job opportunities and school lunchtimes is where children are taught some of these skills, then the UFSM policy starts to make economic sense too. Ultimately it’s all down to the headteacher stepping up to the plate and realising that lunchtime is a fantastic learning opportunity which can help improve pupil attainment and progress as well as ensuring they eat a hot and healthy meal.